As the PrayUSA initiative is exploding across the map, it makes its way to Circleville, Ohio! Pastor Tim Throckmorton of Crossroads Church shared the pulpit with several members of the Ohio House of Representatives as they partnered to host a PrayUSA Sunday. It was this very Sunday they committed to reforge the brokenness of this nation and challenged the congregation to join the movement of national and state leaders that are calling Americans to unceasing prayer. 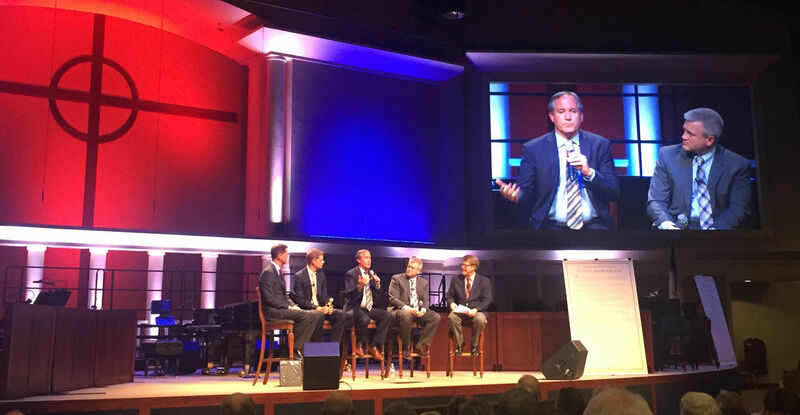 As Pastor Tim Throckmorton stood side by side with elected Government officials, a common passion for restoring America and her people took precedence over title and position…only one mission was represented on that platform- furthering the kingdom of Christ through unceasing prayer. Tim Derickson, Representative of the 53rd District of Ohio stated, “We legislatures need you, and you need us, and we need to be partners in this effort…our title might be a little bit different, but in the end it’s all to serve Him”. Before inviting the congregation to sign the Call to Prayer, Pastor Tim Throckmorton presented the congregation with a challenge. To run from selfish ambition and vain conceit and seek the face of God; it is then that our prayers will be heard and that God will heal our land. It was at this time that the church stood up and joined nearly 10,000 Americans that have committed themselves to pray unceasingly for our nation. Watch the video here! Join Ohio in this extraordinary movement- to call, equip, and mobilize the church to restore this great Republic! If you are willing to become engaged and help advance this Initiative, a three-minute video and downloadable resource kits are available at www.PrayUSA.com. Everything you need is right there, including: instructions, bulletins, flyers, posters, a PowerPoint slide, sample emails, social media tips and much more! Will you carry the torch with us?